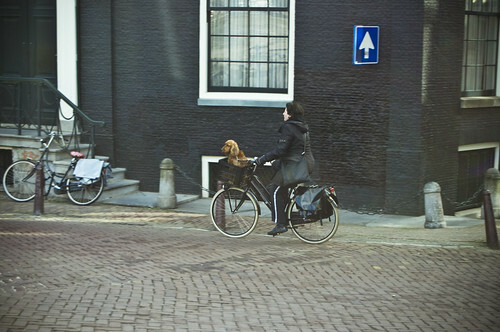 I'm often struck, looking at pictures of Amsterdam, by the amount of brick pavior surfacing to ride over. I don't think I'd like that much. Nice pics. 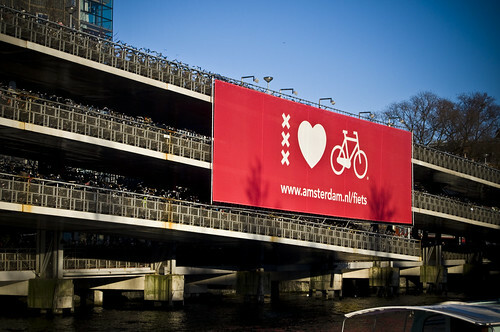 The cycle parking is gobsmacking. That just makes me want to go and live there. Chunkier tyres make it a little smoother - I wouldn't want to be on 700 x 23! 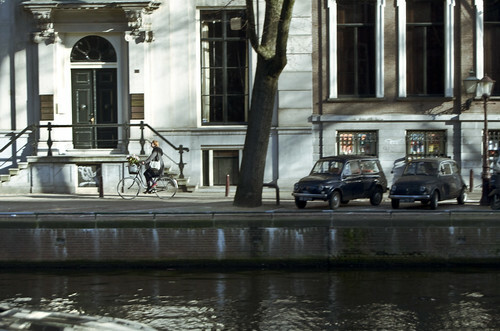 Great photos and not one piece of carbon bling being used for commuting! 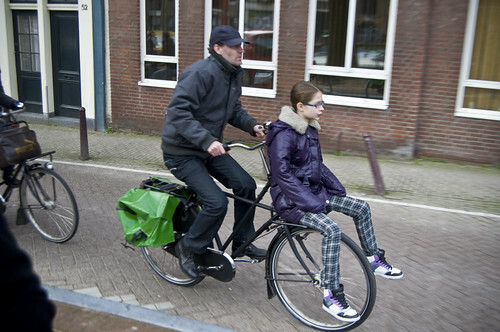 But then carbon bling can't support the weight of your mate sat on the rear rack/handlebars etc. 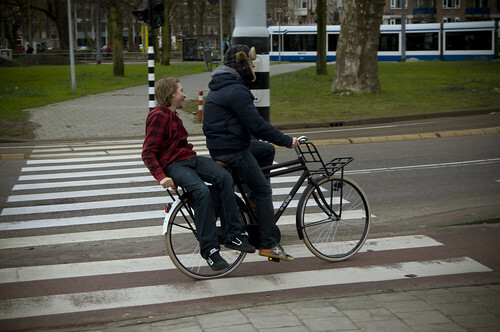 I believe it is against the law to do anything as dangerous as using a bike for only one person! Quite. Those balloon tyres are there for a reason, I suppose. 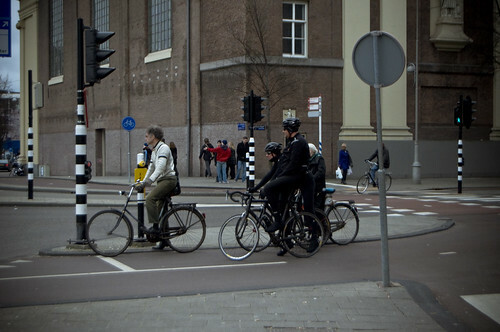 I do like the way that cycling just isn't a big deal in Amsterdam. 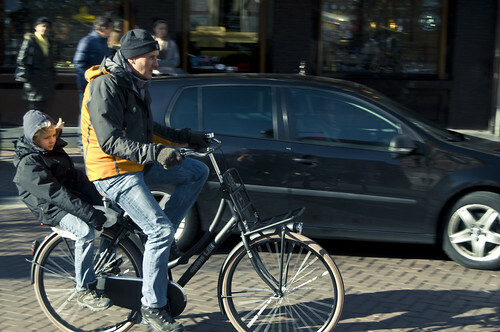 And you don't have to be a cyclist to ride a bike. 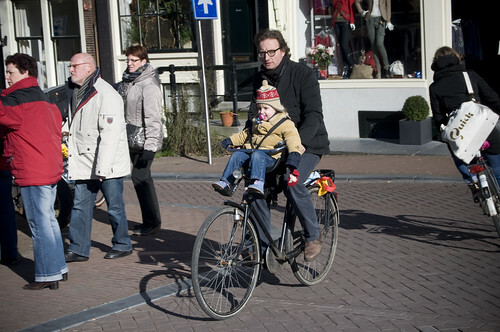 Even if my mum's bike had 550s I remember that sitting on the rack could be quite painful over a pothole! 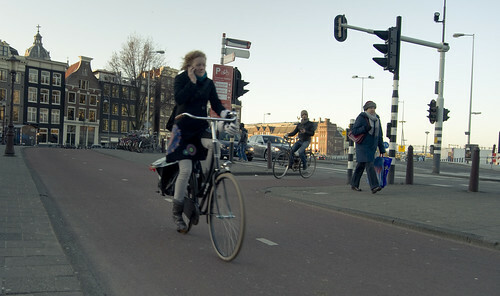 A cycling buddy recently showed us his 1940s repro (of an older bike) which had been dug out of a skip in Amsterdam. Hugely upright and just about the most comfortable bike I have ever ridden. 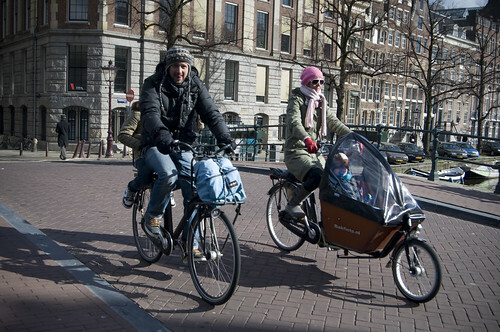 I've owned 2 and ridden all 3 types of bakfietsen in these photos . 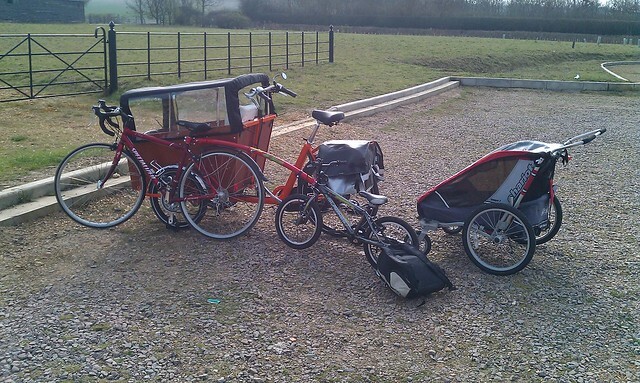 Other than the parking, Cambridge is definitely taking on the dutch/danish kiddie/cargo thing. 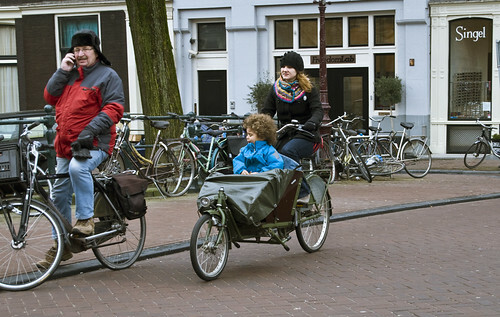 In town this morning, I saw 2 bakfiets.nl trikes, a bakfiets.nl cargobike, a sparta moederfiets, 2 winther kangaroos and a christiania trike. I recall when there were only a couple of them around regularly here. OMG !!! Where are the helmets !!!! Aren't they all going to die soon ?!? Don't they have any sense of HSE ?? 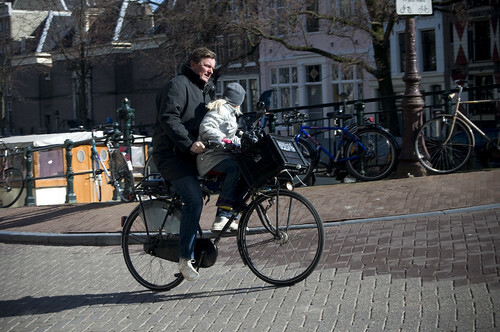 Have a look at the Copenhagenize site if this interests you. 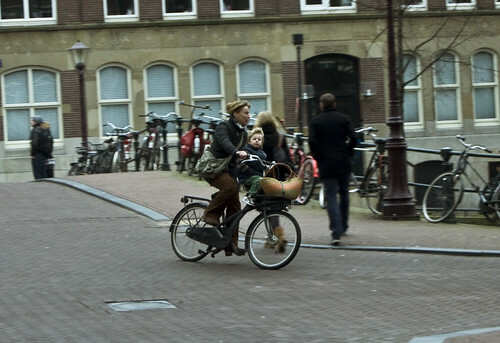 Or CopenhagenChic if you want to look at trendy young thins on bikes. Is that narwhal mooring I see? is the key, I feel. 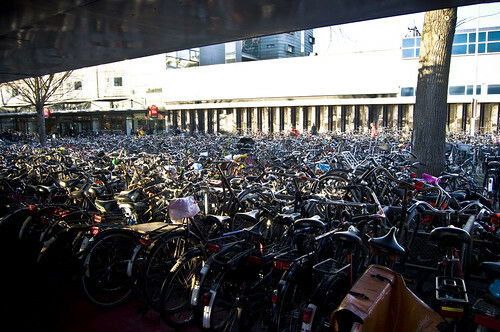 British cities will never be like this because even when they are full of bikes, they are also full of cyclists who think they are doing something special by going to work. This ain't very popular in the low class suburbs of Manchester unlike York or certain parts of London as an example. 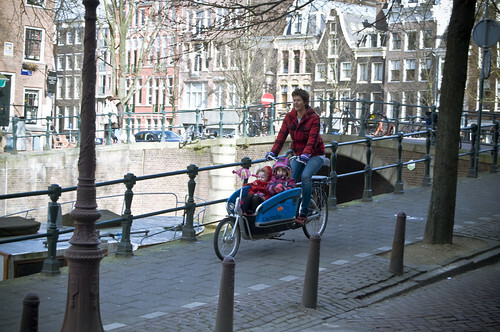 Sometimes my children wear helmets and sometimes they don't, I have even had my six year old little girl just get on the pannier rack and she holds on to the seat post with her feet lodge into the rear bottle cage on the main down tube frame. Some people have never seen children pulled about in trailers in Manchester of what I find a little strange and get questions about why I have them in the trailer and where do you buy them from. I hope my actions will get more people doing the same thing other them driviing or walking about with there children in push chairs. Feet in the bottle cage is a neat trick, we always got Little Cudzo to just dangle his legs wide. I can well believe that many people have never seen a child trailer. In fact, in Poland where I lived till recently, they are illegal - though the law is in the process of being changed and they are available in shops. But it's still a rare sight - money and habit being the limitations rather than law. In fact, I can't think of any occasion when I've seen one in use out there. 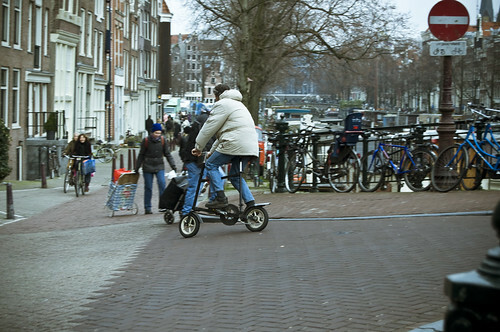 Whilst cycling in Holland i met someone cycling along with 2 beer crates full of beer balancing on their handlebars and their chest.